Edinburgh is awash with excitement in August. Every year an ever expanding collection of arts and cultural events descend upon The Festival City to entertain and delight thousands of people from around the world. 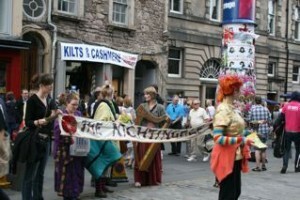 Strangely enough there is actually no such thing as “The Edinburgh Festival”…. confused?…. I was too. 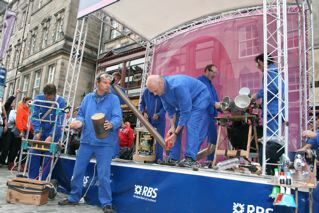 It turns out “The Edinburgh Festival” is a collective term for the all the events happening around the month of August. 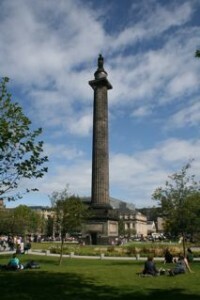 A visit to Edinburgh in 2009 afforded the opportunity to experience over 20 different festivals, including the Edinburgh International Book Festival, The Edinburgh International Festival, The Edinburgh Military Tattoo, The Edinburgh Comedy Festival, The Jazz and Blues Festival and even the Internet Festival. As we were aiming for a free (or almost) day out, we stuck to ‘The Fringe’. You can’t really miss the Edinburgh Festival Fringe, it is the largest festival in town with over 34,000 performers in 2098 shows. 2 During the day, many of them walk The Royal Mile in full costume handing out flyers, and giving small performances to entice you in for their evening show. Take a picnic – Soak up the amazing atmosphere in one of Edinburgh’s beautiful parks. 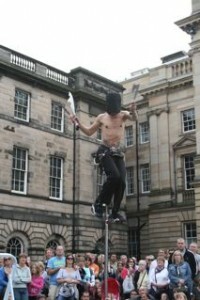 Check out The Street Performers – An event in themselves, the street performers do everything from sword swallowing to the Limbo. They do ask for money as they’re not paid by the festival. Payment however is optional so if you can’t afford it, it’s great entertainment for free, and if you can, a few pounds for some fun live acts is well worth it. Master 4 took great delight in delivering shiny pounds to the “pirates hat”. Special Deals – Check out fivepoundfringe.com for (sorry to state the obvious) 5 pound shows, freefringe.org.uk for free comedy, or if you’re there on the day, listen out for shouts of “Free Comedy Here”, be spontaneous and go in! There are also heaps of shows with “2 for 1” ticket prices. Exhibitions – Of the 56 exhibitions on show during The Fringe, almost all of them were free. Paintings, Posters, Jewellery, Film, Quilts, Soap, Chairs, The Sign Spotting Project, Illusions and even works crafted from a giant wych elm felled in the Royal Botanic Gardens in 2003 were on show in various venues around the city. 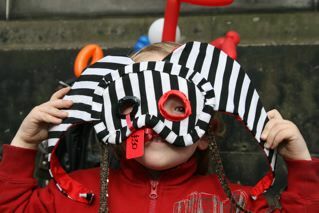 People Watching – You can see everything from ancient samurai warriors, 10 foot clowns, zombies and even a giraffe walking around the The Royal Mile during the festival. The atmosphere is awesome. Be prepared for any weather – Sunscreen, hat, warm coat, umbrella and ‘wellies’ may all be needed on the same day! Take your sense of adventure and spontaneity. 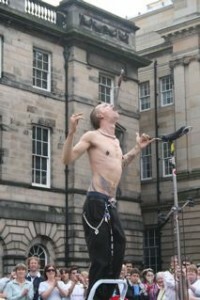 The Edinburgh Festival Fringe Guide 2009 suggests that during the month of August accommodation can be costly and hard to find. Plan ahead and book in advance. 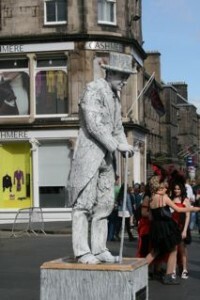 Visit edfringe.com for links to accommodation sites or try gumtree for more options. This entry was posted in Days Out, Events. Bookmark the permalink.